In Canada, maternity benefits are paid to the mother for a maximum of 15 weeks, then there are additional parental benefits. Paternal benefits are available to either parent, or split between them, to a combined maximum of 35 weeks. So if the father remains at work, the mother could receive 50 weeks of payments. 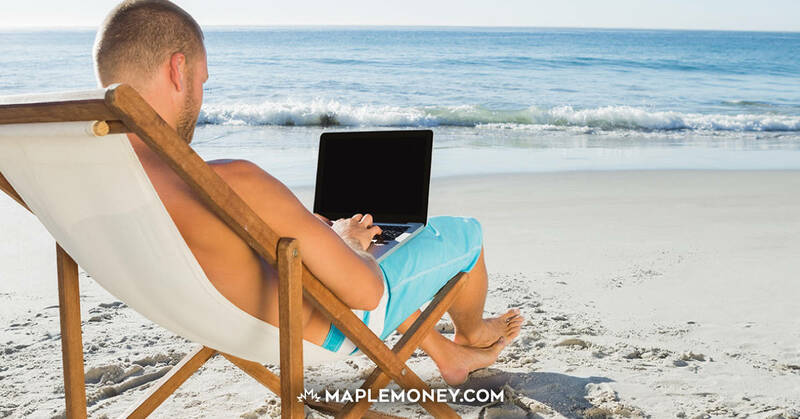 You will receive 55% of your average earnings, up to a maximum weekly payment of $447. This means that if you currently make more than $42,300 a year, you will not receive a full 55% of your income, but will get the maximum $447 a week. This is taxable income and the federal and provincial taxes will be deducted automatically so you will get a lesser amount on your cheque or direct deposit. Working during your maternity leave will reduce your benefits dollar for dollar so there’s no financial benefit to that. However, when you are on parental benefits you can earn whichever is higher, 25% of your benefit amount or $50. So depending on benefit amount you receive, you can make an additional $50-$111 a week without having your benefit payments reduced. While still less than you would make while working, maternity and parental benefits are a great way to enable families to take the time off to properly care for their newborn. When I left on Paternity leave, I received 70% of my income for 5 weeks. Considering that there was things such as my pension plan, QPP (I live in Quebec), I was getting almost the same pay check! We are lucky to live in a country with such a great program! Taking 5 weeks with my wife was making everybody’s life easier as I could play with my older one while my wife was taking care of the baby. Canada has definitley got the US beat here. I took two weeks of sick leave / vacation when my baby was born. In addition my wife only gets six weeks of short term disability that we have to opt into and pay for. Also worth noting that after the initial baby costs are covered (furniture, diapers, etc.) many people report reduced costs due to lack of commuting, and other work related costs (parking, lunches, wardrobe, etc.) so though salary is lower, the dollar can go a lot further. We have to move to Canada! We only get 12 weeks here but it isn’t all paid leave and it’s possible for a new mom to lose medical coverage for a period of time. I agree that our system is better than the US and many other countries. The best part, in my opinion, is that most of the time can be used by mom or dad. This would be really helpful if the female head of household has a higher salary. Wow that sounds like a great system right there. It is a great system and we are very, very lucky in Canada. I just wanted to point out that I believe the percentage of income you can earn during parental benefits has recently changed and you are now allowed to earn slightly more per week (maximum $179 if you are maxed out on EI benefits). Def. have the US beat. Thank goodness! There are a lot of changes coming in the 2011 tax law, but I just read about taxes increases this year, like in 2010, there are no tax breaks for unemployment benefits. A woman’s diet does factor into the process of getting pregnant. There are many foods that are essential for their diets. Folic acid, for example, is one of the necessary components for women in this category. It is important to consume at least 0.4 mg of folic acid daily. When you consider the process of getting pregnant a balanced diet is essential. This includes foods rich in starch and fiber. Women should also increase their intake of vitamin C and vitamin A. Some women use supplements for this intake. Good dietary choices, however, are better options for consuming these nutritional components. You’re so cool! I dont suppose Ive study anything like this before. So awesome to search out someone with a number of original thoughts on it issue. realy appreciate it for starting it all up. this site can be something which is needed on the internet, anyone with a little bit of originality. important position for carrying something new to the net! BILTEK Profits is a Medical Billing Company Serving Sacramento, San Francisco and Northern California. Let us be your trusted medical billing professionals. Maternity benefit is not regarded as Income and should not be taxed. However, many employers make the mistake of over taxing their employees whilst they are out on maternity leave. This can happen if you continue to pay your employee their full wage as normal and recover the maternity benefit directly from the Dept of Social Protection. is just the first paragraph that you could use the supplier’s statement reconciliation process. think that’s the only way to the kingdom of God. For avoiding confusion and chaos, you must also be assessed for in the application in order to obtain the insurance lower by not receiving the guest passenger liability inside your insurance.